Yesterday I showed you some gorgeous beverage dispensers that would be absolutely perfect for a wedding, shower, or really any party. But what to put in them? Punch! No, no, banish thoughts of high school prom and your brother's cub scout potlucks. I'm talking classic, historic, elegant punches. They're just cocktails in a great big bowl, after all. Mixing them up as a punch is a fabulous way to have and serve a signature cocktail at your wedding. Enough limes to juice for 1 quart lime juice, plus have left-overs to slice and add to the punch dispenser and garnish glasses. This really depends on the size of your limes, but 30 is a good place to start. Mojitos are typically made by the glass, and the mint and lime oils are infused through the drink by muddling (basically squishing and pounding the dickens out of the lime rind and mint leaves). It's too much work to do that on this scale, so instead, we have a couple tricks to get that great flavor without so much work. The first is to make a mint-infused simple syrup (recipe in tomorrow's post!). The second shortcut is to make use of the lime rinds. Juice the limes, but once you're done, keep the rinds. Throw the rinds in the rum for 24 hours, then strain them out. That delicious, aromatic lime oil will remain in the rum, and add complexity to the mojito when it's all mixed together. Mix simple syrup, lime juice, and rum together. This can be done a couple days before the event, as long as the mixture is kept in a covered container. At the last minute, add the club soda and champagne. Add lime slices, ice, and fresh mint leaves to the punch. Remember to have a bowl with lime wedges and sprigs of fresh mint next to the dispenser for guests to use as a garnish. Combine wine, brandy, cointreau, simple syrup, and chopped up fruit. Let sit at least overnight to let the flavors meld. Right before serving, add the club soda. Note 1) Any fruits work really well in sangria. I like the crunch of the apples, so always include those, but throw in mango, grapes, cherries, pears, whatever you have on hand! 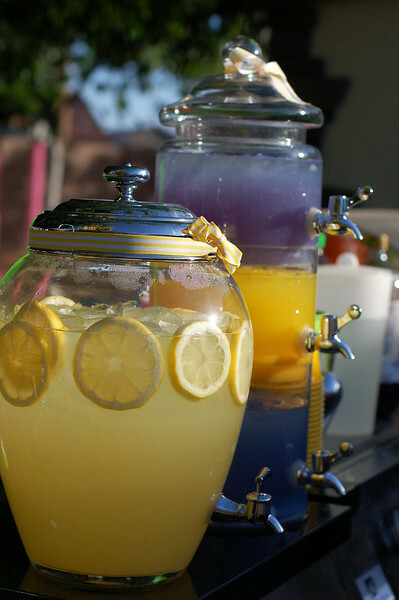 Note 2) When I serve sangria in a beverage dispenser like the one shown above (rather than a pitcher), I always make extra boozy fruit to put in a small serving dish beside the drink. The fruit is half the fun of Sangria! Combine wine, peach schnapps, brandy, simple syrup, and all fruit. Let sit for at least 24 hours in the fridge to let the flavors meld. At the last minute, add the club soda and ice. Notes 1 and 2 above are relevant to this recipe, too! Mix everything but the ginger ale and champagne (this part can be done a day or more ahead of time). Add the bubbly stuff right before serving. If you want to go kitschy classic, add in some sherbet to keep things cool! Interested in an article on the history of punch, and links to some great and classic recipes? Check out this Chowhound article on the topic.